You should consider a power generation system based off of ocean currents instead of waves. You could have pillars that extend into the water and rotate. Then have turbines in those pillars similar to what they use in dam's. The rotation of the pillars would let you align the turbines with ocean currents to get the most effect from them. You could also consider a Hydrogen Fuel Cell power generation system. The technology has come pretty far in the past few years. OSU created an 800hp fuel cell powered car that's going over 300mph a couple years ago. Use that kind of tech and extract the hydrogen from from the ocean water then use the exhaust water to provide more hydrogen. Last edited by Kreigmstr; 07-13-2011 at 08:25 PM.. I expect to use wind / current / solar to generate hydrogen and oxygen from water, yes, and use that as a primary fuel. I also have a plan for harvesting energy from micro-sized wave-action and tides. The problem, perhaps, with currents is that you're being pushed by the current as you harvest it and must resist it, and I want to limit anchor usage--as it rips up the sea bed. Long-term, I can see these cities being fusion powered. These things use minor wave action to produce pressurized air. The train whistle that produces the moan requires ~70 PSI to activate. 70 PSI is a ton of pressure. I figure these things can produce pressure and capture it in its body via one-way valves. This can then be piped out to do work, from running boat outboards to running air-powered generators. It's basically free energy. Each wave-wall pylon could have a pressure column in its middle like the whistle buoys, resulting in a whooole lot of air pressure being collected from minor and major wave action. In fact, the heavier the seas the more air pressure is produced. I'm still looking for a flaw in the idea but haven't been able to find one. With 70 PSI you can run a generator, and with that create drinkable water from seawater. That's our two major problems solved: power and water. I actually like this idea but dam the scurvy we will all have. Why don't we just use the democractic that every country uses that's not america. There are X amount of seats to give away, and XYZ party gets %X of the seats based upon % of votes. Therefore no one party "wins" and it's not a binary selection as america turned out to be. You would need a constant pressure gradient to drive an electric motor, and with 70 PSI, it would be a relatively small motor. The buoys might be able to build up pressure enough to briefly blow a whistle, but I doubt they could provide the constant pressure gradient required. The buoys might be able to build up pressure enough to briefly blow a whistle, but I doubt they could provide the constant pressure gradient required. but consider how much ocean there is to harvest from - and efficiency is only gained through repeated, refined, implementation. critical flaw. Who decides if its moral or ethical? another. who decides who is a consenting adult? Neat idea, but those two flaws alone create plenty of problems in my mind. Why don't we just use the democractic that every country uses that's not america. There are X amount of seats to give away, and XYZ party gets %X of the seats based upon % of votes. Therefore no one party "wins" and it's not a binary selection as america turned out to be. My system goes well beyond that, so I'll give a few reasons. First, despite a republican democracy being a system of minority rights and majority rule, the stasis that's come about has been the majority of poor people deciding that they have the right to pilfer the pockets of the productive members of society, and politically parties find it expedient to support this policy, so it continues. Only a structural change in the way democracies work will fix this problem, and it's the most contemporary problem we have. Al Queda never achieved and never will achieve the damage caused by those pushing the various communalist policies that damage the economy despite good intentions. Secondly, I was to create a political right of separation. If you don't like a law enough to decide you want to leave the jurisdiction that has that law, you should be able to do so. Currently that's very difficult and expensive, but in my society should be much easier and cheaper, creating competition among city-jurisdictions for citizens and responding much faster to dissatisfaction. the separation of economy and state. With that in place, crony-capitalism ends forever, all law-created monopolies end, buying off politicians for favors ends, etc. So, I don't just want each %'age of the populace to have a mere place in the legislature, I would want them to have their own legislature! That way, if their system works and they can convince people to follow them, then it's there for the world to see and they can blame no one for their problems or success but themselves. You would need a constant pressure gradient to drive an electric motor, and with 70 PSI, it would be a relatively small motor. 1st question; are you by chance an engineer? Would be fun to work on this project for real. Yes, you'd need constant pressure, and each buoy's body is a pressure vessel, collecting pressure over time to a constant gradient. I looked into the Coast Guard buoys, their whistling buoys range upwards of 17,000 pounds. I figure at that weight we could put much more than a single air chamber in them, probably multiples of them, producing comparatively large volumes with each swell. Beyond that, since these buoys form the protective wave-guide that walls the city, there's at least dozens to hundreds of them, meaning a large amount of energy is captured from each swell. 1. We pipe air pressure to a central area where it's used collectively to drive a generator at constant pressure. There might be intermediate devices that step up the air pressure at a loss of volume to achieve the requisite ideal PSI. 2. We can use even 70 PSI to drive water purifiers. I think this is an exciting application, because I know for certain that 70 PSI is enough to do it, and that it doesn't take much, meaning that we could create a self-powered water purifier for the 3rd world coastal regions. One of the recent new WP techs I read about was built into a straw and used the power of suction from the human mouth to drive the gradient process :P So, 70 psi can surely do it. 3. We pipe large volumes into one of the super efficient circular-vane generators (forget the name...). They can operate at up to 90% efficiency but require very low volume. Meaning one on each buoy could do the job. (IIRC it was Tesla that invented these?). Again, each buoy is a pressure vessel. the 70 PSI is not simply sent to the generator, it's capture and stored with each swell, to be piped out later when full. Buoys could then be tapped in serial or chained together to provide constant flow. For that matter, compressed air can be used by itself to power all sorts of things, and is far more wet-environ friendly than electrical power. You could for instance drive an outboard motor via compressed air. And 70 PSI actually is a ton of pressure depending on the volume you give it. On Myth Busters they shot the chicken-cannon at some 300+ mph at 50 PSI :P The volume of air is probably more important, and this system should generate a whole lot of volume with all the buoys I need total. One of the things that's different about objectivism is that Rand claims to have discovered a "scientifically provable ethical system." A discussion of that is outside the scope here, but suffice to say that her root value is life. That which furthers life is ethical and that which does not is unethical. There's a whole chain of ideas after that, but I recommend Leonard Peikoff's book "Objectivism, the Philosophy of Ayn Rand" as a starting point (he being the modern, living popularizer carrying her torch and her avid student while she lived). It's a rational ethic based on reason. This one's actually far easier than your previous question. Rand herself provided a rubric and it was this: self sufficiency. If you're able to support yourself via a job or w/e, you're considered a responsible adult, can vote, and have accepted the keys to your life, etc. If you're not self-supportive, you may no longer vote. Thus, anyone accepting state welfare would be unable. That sure would change things in our current society. It's possible to grow fruit on the sea in enclosed towers. In such a system you'd use artificial light, temperature control, and could grow any crop year-round by making it say think it was summer when it's winter via temperature cues. By enclosing the crops you could stop use pesticides, and water doesn't leak away into the water table or on the wind. You could also increase the latent CO2 % in the air causing the plants to grow like crazy! What holds this back is mainly the cost of energy. But, if the buoys provide essentially free energy, you could do it. I'm now calling this "Project Atlantis" as "Atlantis" may not be the most appropriate name for the final state. Also, my concept has progressed in a few ways since the initial post. Rather than having competing governments within one jurisdiction, which is basically impossible and rife with contradictions, I want to extend the right of free association to create a legal and political right of separation. If you don't like the policies of a state, you can extricate yourself from it instantly and join another--or start another. Rather than having states like the US states, that is large jurisdictions, jurisdictions would be limited to cities and their surrounding economic zones. Thus, if you want to start a jurisdiction, a city, next-door to an existing one, feel free. The ramification of this creates what my original post sought--competition for citizens, just by another mechanism, one that would actually work. The root crux of the modern political problem is that the majority can always outvote the minority, and the minority cannot escape the majority. It's the latter that I seek to rectify. Because what if the minority is right? Then they'll suffer the same fate brought by the majority's wrong-policy simply because the majority is obstinate. So, the solution is the political right of separation, allowing people to escape from under the jurisdiction of the majority and start their own, unopposed. No longer will party A be able to blame party B for the state's failures, as the two can separate and achieve unopposed power over their own fate. 1. In a such a situation, the modern frustration caused by political disagreement would be completely eliminated. Think of how beautiful that would be. Regardless of your political ideals, you'd be free to exercise them and chase them to their ultimate end (as long as you respect the basic rights of all under your jurisdiction, meaning this is a voluntary society). 2. We'd finally have an answer as to which political ideas actually lead to successful societies. Once you separate them and allow them to exist side by side without the interference of the opposite ideologies and policies, you get pure ideology, pure principle applied to the problems governments are used to solve. 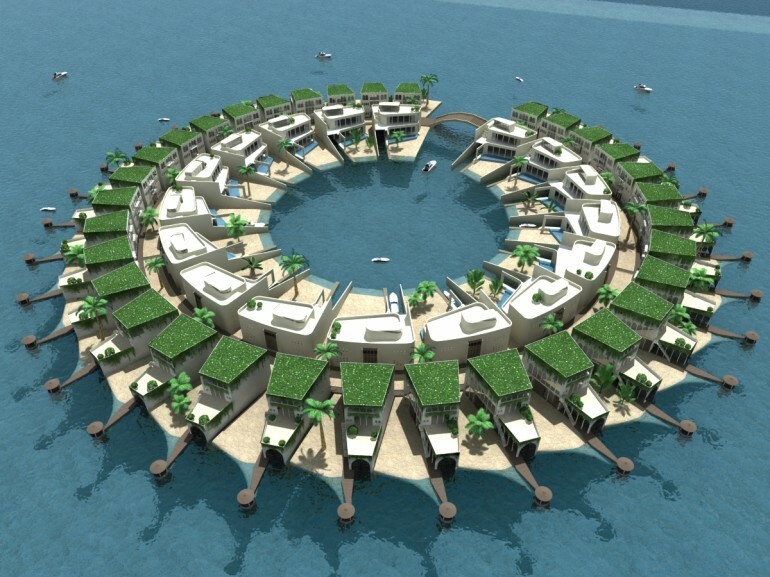 This, it would be safer UNDER WATER! I see what you did there. Maybe something like this could work. I have heard a big cruise ship like this too. Not quite, i never beat it, because I couldn't get into it. Never got far enough to learn it was cast as an anti-randian dystopia. I would say we have already enough of those (anti-randian dystopias) and I'd like to try out the concept for real. And, crazily enough, these concepts are currently in development. 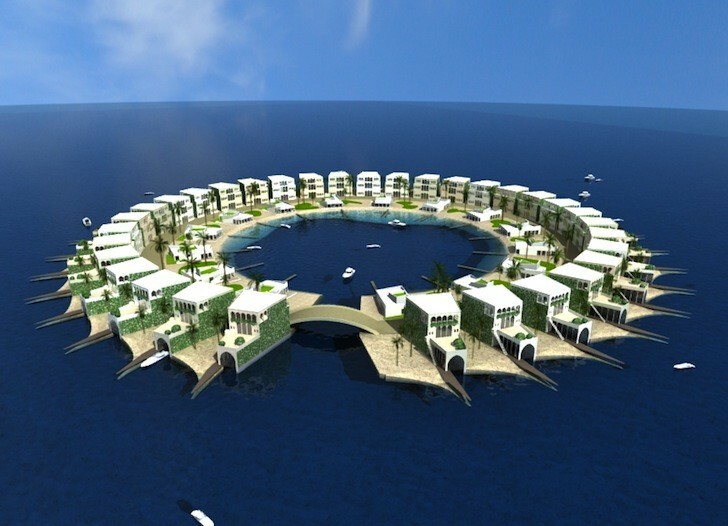 "Floating islands are environmentally friendly and leave a zero footprint after its lifespan, and opens opportunities where there is a scarcity of land," Jasper Mulder, General Manager of Dutch Docklands Maldives told Gizmag. "They are the answer to urban limitations and climate change. It secures a safe and sustainable future where conventional building methods fail." 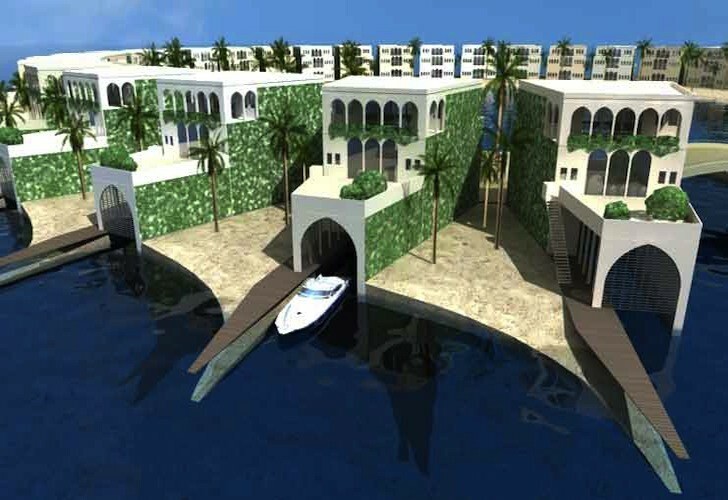 The 89 floating islands proposed for the Middle East includes residential and commercial floating developments with a total surface area of 220,000 square meters (almost 2.4 million sq.ft). Last edited by Anenome; 11-24-2011 at 02:10 AM..
Yeah, there's a couple "efforts" to do similar things out there. What I'm trying to lay down is an intellectual and philosophical foundation for an offshore community that can spread throughout the world and indeed into space itself. To do that, to spread onto water and into space, we'll need to deal with new challenges, need new political structures--hopefully improved ones. The United States is a product of the 18th century, the culminating political achievement of the enlightenment period. But it's been downhill since then. The US Constitution wouldn't pass a majority vote today. That link you give is useful I'll read up. But it's vision is small in scope--just routing around visa problems. I'm trying to create a system that will last literally millennia.